At this low level price point the Spectre II is a great piece of kit. It isn’t the smallest survival bow when broken down and it doesn’t have the best accessories. What you do get is a good functional survival bow you can take anywhere, assembly is quick and easy too. You can pay more for a survival bow, but you need to think about what you need this for. Get one to tuck away in a cache and it’s a great investment. Spectre was a great film. This isn’t the sequel. 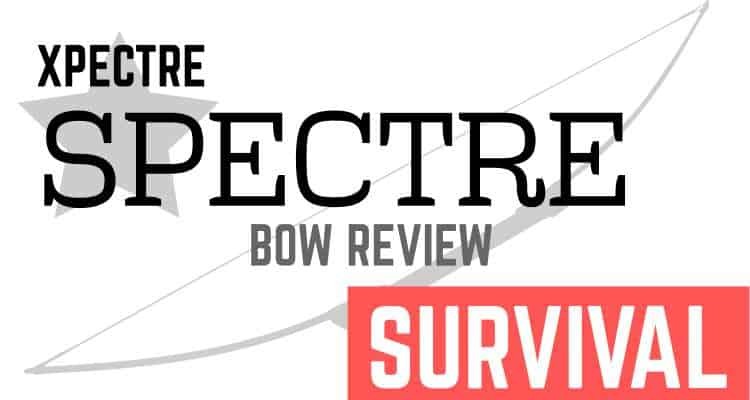 No the Spectre is a compact take-down survival bow from Xpectre. They produce a small range of these types of bow and the Spectre is the most affordable of them all. A survival bow is designed to fold down small be durable and be something you can take anywhere and assemble with ease. Lets see how this one stacks up. An in-depth review of the Spectre showing how to make a nifty paracord grip to improve the ergonomics of the riser. The riser on this bow when broken down measures 23″ in length. When assembled and ready to shoot it is effectively just a square metal tube. There is nothing added to the riser for grip or comfort ergonomics. You can always make your own enhancements to the riser to make a more comfortable grip using paracord or any material of you choice. Still, this isn’t something designed to be used for long periods of target archery! You can’t move the rest as there aren’t attachments points on both sides of the riser. In order to change the handedness of the bow you simply turn it upside down and the rest will be on the other side. One of the things you absolutely want a survival bow to be is portable. This one breaks down into 3 pieces (and the string) the longest one measuring 23″. That’s small, but not the smallest survival bow we’ve reviewed. A 23″ long case however is still something you won’t find difficultly transporting around, especially as you can shoulder it in the carry case. In order to assemble the Spectre you need to fit 3 pieces together and string them. Each of the limbs slide into the riser and locate on a securing pin. Once these pieces are in place the final step of assembly is to string the bow. The limbs are designed to stay in place by virtue of the tension of the bowstring. You’re probably best stringing this bow with step through method to keep things from sliding apart before the string tension is in place. A Dacron endless loop black string is supplied, this doesn’t come with a nock point and it’s probably a good idea that you add one in your preferred way. The higher draw weight bows require slightly shorter strings. Normally the package supplied with the Spectre includes 3 arrows. These aren’t takedown arrows like you get with the Nomad. They’re single piece 30″ carbon fiber arrows with fields points and plastic vanes. A field point isn’t going to be much good for hunting, so if you’re after this bow for a real survival situation you probably want to look at sourcing some broadhead tips to fit to those arrows. These limbs are single piece fiberglass and resin composite. Replacement limbs are available direct from the manufacturer should you lose or break one. You may also want to mark your limbs after receiving them so that you always insert them in the same orientation. This will make sure that they’re always bending the same way when you shoot. That should give them a longer life. Above is a Spectre with all the pieces laid out. This is a short bow. At anywhere from 46-50″ depending on the draw weight you’re not getting the length of limb that a normal traditional or recurve bow shooter would be looking for to give them the most forgiving shots. As a survival tool however the bow shoots well. Not a thing of beauty, this bow is a thing of function. The limbs aren’t the same color as the riser so there’s a 2 tone look to this bow. You can paint it and give it whatever finish you desire but we aren’t going to give this top marks for styling. It’s something to keep in a cache or bag somewhere for a survival situation. Usually more than twice the price and not supplied with any arrows. But… you get what you pay for. The SAS Tactical is a longer assembled bow at 60″ AMO. This may give you a more forgiving shot. This one has storage inside the riser for takedown arrows. It comes with a camo carry bag rather than plain black. It’s lighter overall due to the materials used in construction being of a higher grade. Comes coated with a non-reflective paint too. The SAS is a longer when assembled and slightly smaller 21″ when fully broken down.. Checkout the full review here. The Nomad is from the same company as the Spectre. It’s usually slightly more expensive and is limited to a 45 lbs draw weight. The reason for that is probably because the limbs on the Nomad break down into 2 pieces, making the bow 5 pieces fully disassembled. This means it can break down further and only measures 17″ when in storage. That’s pretty small. 4″ shorter than the Spectre. The Nomad also usually comes with take-down arrows too although everything else about it remains the same as the Spectre. More in our full review. I own both the nomad and the rapture xepectre bows and I switched the limbs to get a smaller packed bow. It shoots well ,you lose some # . . the whole thing can be put in a day bag. In a car or truck or walk on a train; bus.